Anon. sale; Christie's London, 24 June 1927, lot 70 (55gns. to Sampson). Like Gardenia St George on a Donkey, this beautiful drawing with its light touches of colour wash, is another of Orpen's 1910 'Howth' works. In the summer 1910, and again in the summer 1913, Orpen seemed to be particularly in touch with Polymnia and the other muses, as he delighted in plein air compositions in and around the headland of Howth. His mortal muses were his favourite Metropolitan School of Art students and models as well as his own wife and daughters, and additionally, in 1913, the American beauty, Mrs Vera Hone, wife of the author and biographer, Joseph Hone.1 The best of these pencil and watercolour creations, with their delicacy and draughtsmanship, can be counted amongst some of his finest works, and serve to demonstrate his mastery of both line and subtle colour.2 This craftsmanship was to re-emerge in many of the works he produced as an Official War Artist of the Great War.3 In some of these, the joie de vivre atmosphere of figures set within the beautiful and serene landscape of Howth's cliffs and craggy outcrops of rock, on a glorious summer's day, is transformed into an eerie, stark and unsettlingly incongruous beauty. Soldiers going about their business, or the lifeless fallen, juxtapose with the manufactured carnage of battle. There, the ground, of white sun-dried mud, sometimes shimmering with the reflected light of a blazing sun, assimulates these remains. Mindful of those craggy outcrops of Howth, these scenes are often set against a backdrop, but in their case, they are usually ravaged man-made structures. 1 Vera Hone née Brewster was a real inspiration for Orpen. During 1912 and 1913 he embarked on a series of portraits of her in various guises, The Angler (Tate Gallery, London) with rod and blue hat, or, in military-style uniform as in The Roscommon Volunteer, (untraced) or The Roscommon Dragoon, (private collection). Orpen annotated a drawing of her 'I'm afraid this does not give much idea of Mrs Hone but she is really very good to paint' (National Gallery of Ireland, Dublin). She was also included in a number of the 1913 'pencil and watercolour' drawings. She may also have been the figure in On the Cliff and one of the figures in After Bathing. For further reference on the Hones see Bruce Arnold, Orpen: Mirror to an Age, London, 1981, pp. 284-285. 2 Orpen chose a number of these 1910 and 1913 pencil and watercolour works for inclusion in a set of high quality photogravure prints, produced under his direction by Chenil Galleries and published in 1914 to very favourable reviews. The works chosen included The Draughtsman and His Model (1910) and The Breeze (1910) (both Victoria and Albert Museum, London), On the Cliff (1913) (private collection), The Bather (untraced), Sighting the Boat (1913) (Pyms Gallery, London), and After Bathing (Mildura Arts Centre, Mildura, Australia). 3 Orpen gave most of his works produced under the Official War Artists Scheme to the country and they now form part of the Imperial War Museum Collection. The collection, consisting of one hundred and twenty five plus works (drawings, watercolours and oils), produced between 1917 and 1918, gives a profoundly moving visual account of the consequences of war, and are therefore worthy of considerable reflection. 4 The figures in After Bathing and The Breeze were incorporated into the oil entitled Landscape (Walker Art Gallery, Liverpool) and the figure of Kit, the artist's second daughter, seated on the grass in Sighting the Boat appears in The Edge of the Cliff, Howth (1913) (Smurfit Collection). 5 In the proceeding year (1909) Orpen undertook several individual full oil studies of both Grace and Mary including In Dublin Bay (private collection) (Grace) and On the Green Isle of Erin (untraced) and The Wreck of the Toy Boat (Mary). As far as Grace was concerned this continued into 1910 with such works as A Summer Afternoon (private collection), On the Beach: Midday (untraced) and Howth Head Looking Towards Dublin across Dublin Bay (Pyms Gallery). 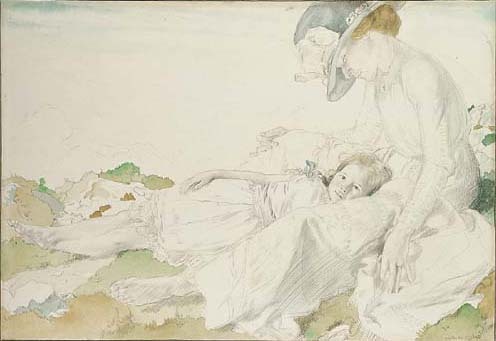 Also in 1910 he produced many individual drawings of both Grace and Mary, in different poses, often with colour wash.
6 The 'Mother and Daughter' theme was one that was close to Orpen's heart, and one he was now revisiting. Between 1902 and 1904 he produced a series of drawings of Grace and Mary based around the baby Mary in her crib or at bath time. The series culminated in the beautiful oil Bath Hour (1904) (William Humphries Art Gallery, Kimberley, South Africa). In 1906, the year of his second daughter's, Kit's, birth, he revisited the theme again when he produced at least two further drawings of Mother and Daughter with the child asleep on Grace's lap, Sleep (1906) (Whitworth Art Gallery, Manchester) and Mother and Child (1906) (British Museum, London). 7 For further references for Midday on the Beach see P. Konody and Sydney Dark, William Orpen: Artist and Man, London, 1932, pp.187-188; Cork, ROSC, 1971: Irish Art in the Nineteenth Century, pl. 18, no. 109; National Gallery of Ireland, Orpen Centenary Exhibition Catalogue, page 44 and plate 12; A. Crookshank and the Knight of Glin, The Painters of Ireland, c.1660-1920, 1978, p. 271, and colour plate 62 (page 277); Barbican Art Gallery Exhibition, Kenneth McConkey Impressionism in Britain, 1995, pp. 171 and 172 including colour illustration.